RIM's BlackBerry 9900 is the device that the BlackBerry diehards have been hoping, wishing, and waiting for since the original Bold launched way back in 2008. Apple iPhone 4 is a touchscreen smartphone developed by Apple Inc. It is the fourth generation iPhone, and successor to the iPhone 3GS. The Samsung Galaxy S II is a smartphone running under the Android operating system. It is the successor to the Samsung Galaxy S, with a different appearance and significantly improved hardware. The dual-core Android-based HTC Sensation 4G is the latest foray of HTC in Smartphone Market. It's screen is awesome and the camera is top-notch. After being defeated by Apple and Samsung in the tech war, Nokia is seeking to quietly reestablish itself in the market with its latest smartphone, the Nokia N9. Do you ever need to block some incoming calls? Such as private or unknown numbers, your ex-girlfriends, your annoying boss after work time? Or maybe everybody but your managers during a work meeting? If so, then you need Cerberus Call Filter. * It is the cheapest on the market! Keep track of time with this nifty little utility on your phone. With this tiny tool, your phone will chime on each full hour, like most digital watches. But there is much more. The chime sound is fully customisable. 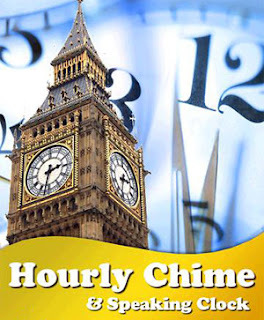 There are 18 chimes installed with the program, ranging from very modest time pulse signals and subtle zen-style sounds to sonars, bells, church bells, Big Ben, etc…. Ofcourse you can also set any of your personal favourite MP3 (or other soundfile formats) as chime sound. Or, you can even let your phone TELL you the time in "Speaking Clock" mode. You can select the chime to be played once every hour, or use the "churchbell" mode to play the chime X times the actual hour. Since you probably don’t want to be woken up each hour at night, you can choose to play the chime only during the hours you want it, i.e. only from 9 a.m. till 5 p.m. Hourly Chime runs fully in the background, has very small file size and consumes very little battery power. Feed your BlackBerry Phone with this cool app. Feel free to express your feelings through added emoticons here. Also, make your phone cool with different cool symbols. Enjoy! Have you ever wanted to have a fun photography application on your BlackBerry device? Photo Booth is inspired by those public photo booths where people can take their passport pictures. Like a film strip, the four photos are shown consecutively on a vertical strip. 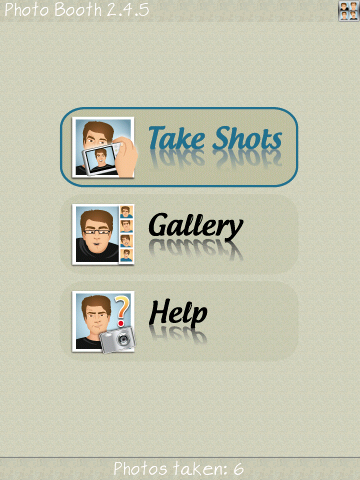 To use this application, simply open the application and select the "Take Shots" button. You can choose the frame color for your pictures and then your device’s camera will then take four consecutive pictures (with flash). After all four pictures have been taken, they are put together as one image on a vertical strip with a colored frame. This is a fun app for those who like to take pictures and have them woven together as one image. Easy-to-use no-nonsense screenshot utility saves single or multiple screen snapshots to media card. Adds "QuickShot Screenshot" (save screen image) to most menus. 1. Select the QuickShot icon on the homescreen. That will load the app into the background. When you're ready to take a screenshot, use the application switcher to switch to QuickShot. That will take a single snapshot and then QuickShot will close in the background. 2. Select the Multi Screenshot icon on the homescreen. This is the same as (1), except that it keeps the app loaded in the background so you can use it over and over. When you're finished, you can close the multi-shot session by selecting the QuickShot icon on the homescreen. Images are saved in JPEG format at 87% quality in this FREE version. In the paid version, either PNG or JPEG format is selectable with JPEG quality from E-Mail size to print quality. Images are saved on the media card in Blackberry/Pictures, uniquely named by date and time as Screen-YYMMDD-HHMMSS so they can be sorted by name in order of capture. * There is NO NAG SCREEN, no ads, no "Buy" button, no expiration, and no limitation except that the image format and quality are locked at a compromise between size and quality which is suitable for most purposes. There is also a very faint watermark imprinted on the lower-right corner (see screenshots) of all screen images saved, only in the FREE version. ** Settings are found in the homescreen Options icon. * If you see an error message and the menu item is missing, please set Interactions and User Data permissions to Allow and reset your phone. 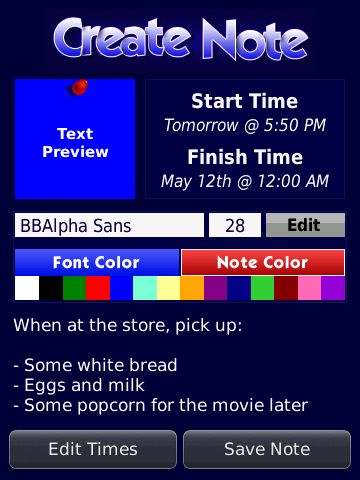 MenuX is the first software that can help you to customize your Blackberry menu with tons of feature. A great tools for System enhancement! 1. 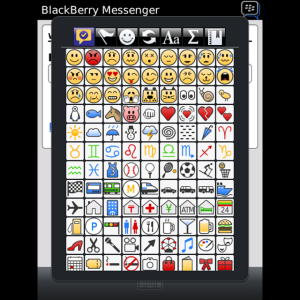 Add a Call item to your Blackberry’s menu. 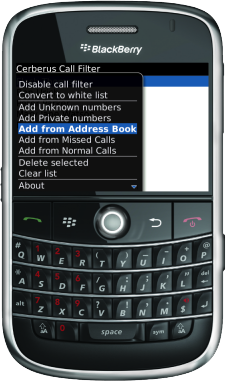 Easily setting up the pre-defined number and name, then you can make the call to a specific number just right on your Blackberry’s Menu. 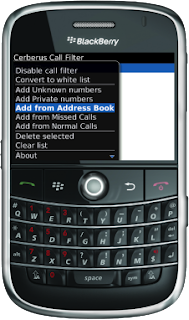 Just fill in or Insert from Blackberry Contact List the appropriate contact fields to add a contact to your menu. It’s so convenient and fast. 2. 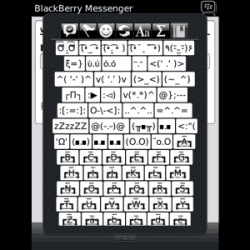 Add a SMS item to your Blackberry’s menu. Easily setting up the pre-defined number and name, then you can make a new SMS to a specific number just right on your Blackberry’s Menu. 3. Add an Email item to your Blackberry’s menu. Easily setting up the pre-defined number and name, then you can make a new email to a specific email address just right on your Blackberry’s Menu. 4. Add a Boost Memory item to your Blackberry’s menu. Everytime your device is slow, click the Blackberry’s menu and choose "Boost Memory", then your device will release waste memories. 5. Add the current Time to your Blackberry Menu, this time menu is visible from every Blackberry apps like: facebook, browser, twitter,…. and more, almost every application. 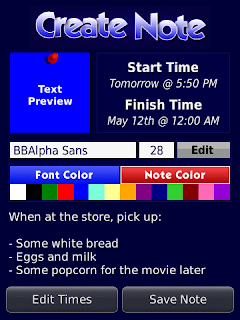 Now, you can watch the current time right on your blackberry menu. You can also add the symbol to the item for more convenient and more funs! 6. 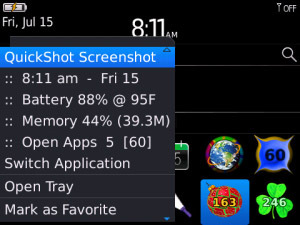 Add an Application monitor menu item to your blackberry menu. 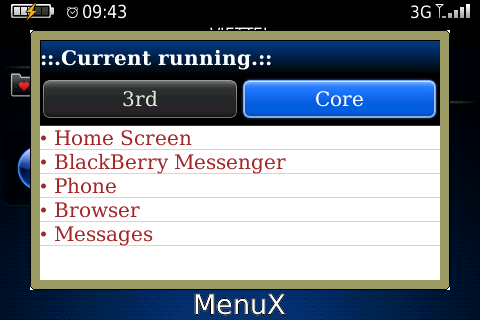 You can view the number of current running applications everytime and everywhere right on your Blackberry’s menu! You can see the total number or click to launch a list of the actual apps currently in use. All the Custom menu item are easily to create and remove. No need to restart after add or remove the custom menu item. Built in Help for easily to use! With Home Screen Notes, you can create a note or reminder and post it directly to your home screen. Have a grocery list? Need to remember to pick up a shirt from the dry cleaners? No problem. 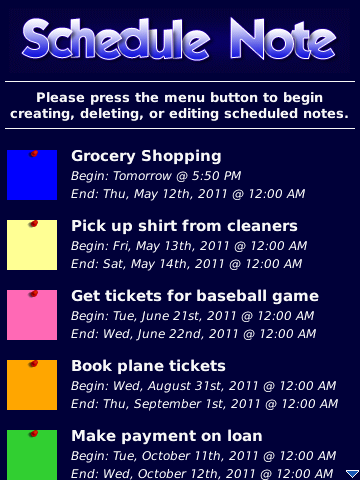 Just create a note and post it to your home screen. It’s fast, simple, and there’s none of the clutter caused by paper notes. The best feature of all is that you can schedule notes to be posted and cleared in advance so that everything is more streamlined. 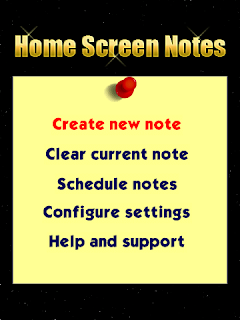 *Note* Home Screen Notes requires that you go into the settings (within this app) and choose a desired wall paper before creating a note or reminder and is not compatible with wallpaper rotation apps, BeWeather wallpaper option, or most themes that do not let you set a wallpaper. "Locked" or "Copy Protected" wallpaper sample images may prevent app from posting notes. If this is the case, please choose another image.